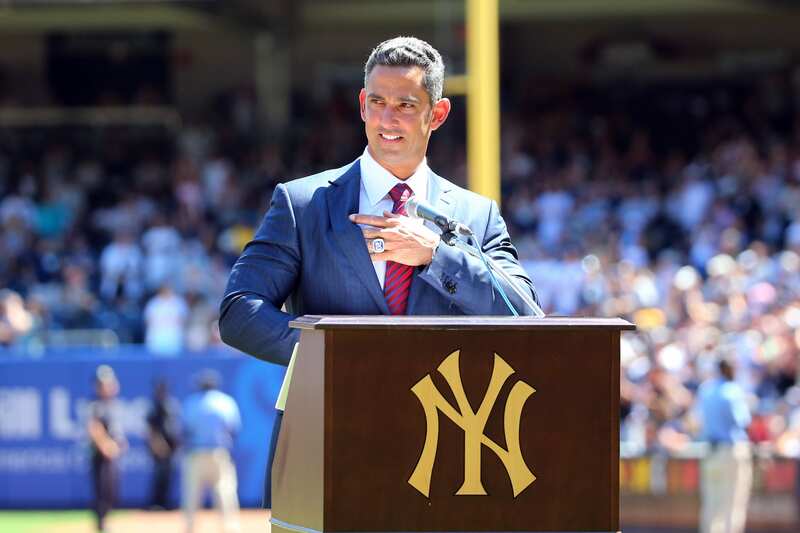 Happy Birthday to beloved retired catcher Jorge Posada (1971), who passed the 250 home run and 1,000 rbi marks in 2010. Jorge was drafted by the New York Yankees in the 24th round of the 1990 amateur draft, and he was seriously mentioned in the 2003 MVP voting. Having one of his best years in 2007, Jorge signed a four-year extension, but he was lost for the 2008 season due to shoulder surgery. Back in the fold since 2009, he continued as a solid member of the Yankee offense as a DH in 2011, and rather than sign on with another club, he resigned afterward, much to the relief of all Yankee fans. Yankee players achieved some nice career numbers in a 10-inning, 8-7 home win over Minnesota on August 17, 2015, but it was a very costly victory. Young Brian Mitchell and Caleb Cotham gave up five runs into the fourth, but Brian McCann and Carlos Beltran homers helped tie it at 7-7 through six. Brett Gardner scored his 500th career run after walking in the second, and an intentional free pass to Beltran in the 10th was the 1,000th walk of his career. This followed back-to-back doubles by Greg Bird and McCann that produced the winning score. Heady stuff for Bird, who would play well down the stretch, but he was only in this game because Mark Teixeira was hurt by a foul ball off his shin while batting in the sixth. It took weeks to ascertain that the shin bone was broken, and that Tex’s superb comeback season had come to a close. The three first-inning runs KC jumped Mike Mussina for in Yankee Stadium on August 17, 2008, were quickly forgotten as Alex Rodriguez and Xavier Nady first-inning home runs and a second-inning grand slam by Jason Giambi led the Bombers in a 15-6 rout. Giambi scored his 500th run as a Yankee in this game, Derek Jeter went 4-for-4 with three runs scored, and comic actors and father and son Jerry and Ben Stiller moved the games-counter indicating games left in the old Stadium down from 17 to 16 in the fifth inning, one day after Darryl Strawberry had carried out that honor. The Yankee highlight was on the offense in 2002 on August 17 as Alfonso Soriano became the first ever second baseman to join the 30/30 club when he blasted his 30th home run in an 8-3 win over Seattle. And in his first at bat of the day, Bernie Williams came within one of the major league record when he stroked a single for his 11th consecutive hit. He would not reach safely his next time up.